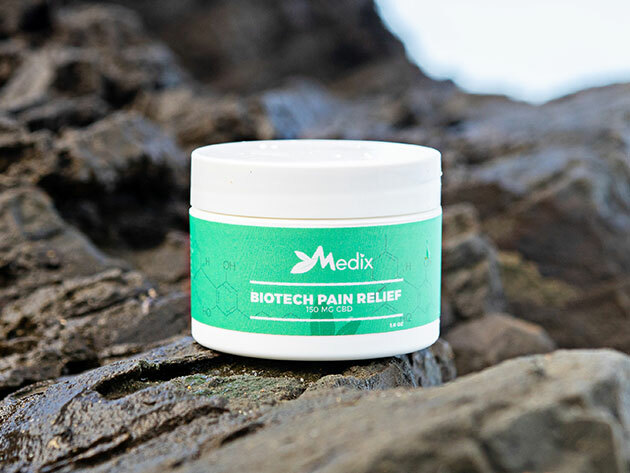 Medix’s 150 Mg CBD Topical Pain Relief Cream might help ease joint or muscle pain. Over the past year, CBD oil has grown from a hippies-only accessory to the must-have supplement that everyone’s talking about. Proponents claim that it can treat a range of ills, including anxiety, insomnia, and pain. Celebrities reportedly use CBD oil on their feet before red carpet events to reduce pain from high heels, and countless word-of-mouth testimonials tout CBD’s pain-relieving benefits. Medix’s 150 Mg CBD Topical Pain Relief Cream is an affordable way to give CBD lotion a shot. This CBD lotion has 150 mg of high-end CBD derived from hemp plants. It contains less than 0.3% THC (the compound in marijuana that makes you feel “high”), so you can use your CBD lotion without getting loopy. It helps loosen tight muscles after a tough workout, soothe stiff joints during cold winter days, and curtail that nagging knee pain you’ve had off and on for years. The cream also contains soothing menthol and aloe and moisturizing Vitamin E that packs an extra punch. Usually, it costs $59.99 to try Medix’s 150 Mg CBD Topical Pain Relief Cream for yourself, but right now you can see what all the CBD buzz is about for only $25 (58% off).